AUSTIN, Texas – Decreasing housing inventory paired with strong demand continues to drive Austin’s growing affordability crunch, according to the May 2018 Central Texas Housing Market Report from the Austin Board of REALTORS® (ABoR). Austin has reached a new high for home prices just when Austin City Council is in the midst of debating whether to adopt an updated land development code through the CodeNEXT process. An updated code has the potential to ease housing affordability pressures by allowing a wider variety of homes along corridors and in transition zones while streamlining development regulations. Over the last five years, the pace of home price growth in the Austin-Round Rock MSA has exponentially outpaced the median family income growth. 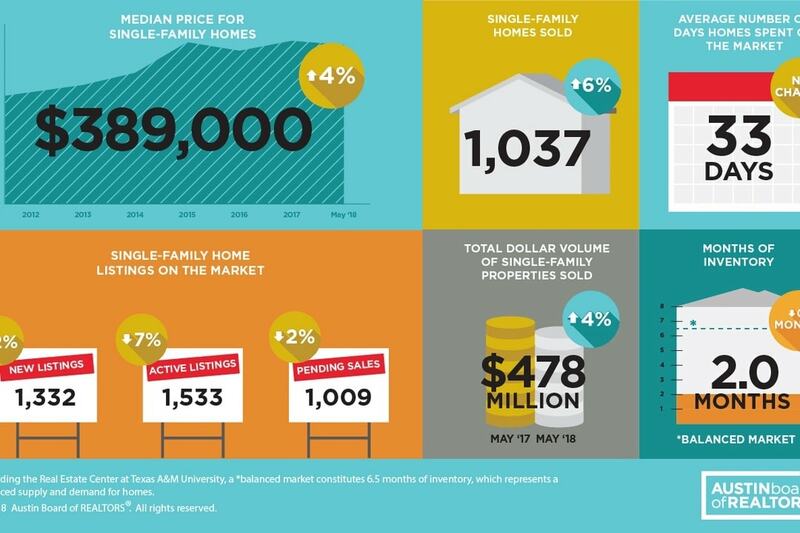 According to the Department of Housing and Urban Development (HUD), Austin-Round Rock median family income increased 17.5 percent from 2013-2018, while ABoR data shows that median home prices increased 42.5 percent from May 2013 – May 2018. The growth in housing prices in the city of Austin also has implications for the Central Texas region at large, where home prices continue to rise amidst tight inventory. In May 2018, seven in 10 homes sold within the five-county MSA were sold outside of Austin city limits. In the Austin-Round Rock MSA, home sales rose 4.2 percent year-over-year to 3,210 sales in May 2018 and housing inventory decreased from 2.8 months last May to 2.7 months this year. During the same time frame, the median home price increased 4.8 percent year-over-year to $325,000. See the full Austin Market Report - here. Head over to our blog for more news on real estate and all things Austin.